Deviled eggs are always a crowd-pleaser, and with Easter around the corner we’ll sure have our hands on enough eggs to make this tasty appetizer! 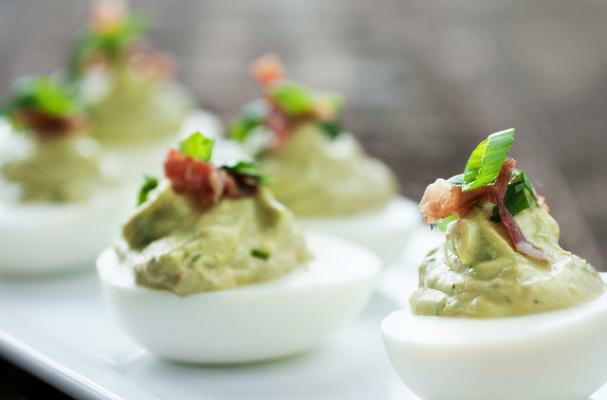 In this delicious deviled eggs recipe, avocado is used in lieu of mayonnaise, making these eggs lusciously creamy and wonderfully flavorful. Before serving, garnish them with crispy bits of bacon and a sprinkle of paprika for color and flavor. Step 1. Slice eggs in half lengthwise and scoop yolks into a bowl, reserving whites for later. Step 2. Mash yolks and avocado with fork, stir in mustard, mayo, and spices. Step 3. Pipe or scoop into saved egg white cups. Sprinkle with bacon and paprika.